The data in a Gen3 data commons can be browsed and downloaded using tools either in the submission portal website or from the command-line. One method of accessing metadata in a Gen3 data commons is using the data exploration tool in a web browser. This is page can be reached by clicking “Exploration” in the top navigation bar or by navigating to the url: https://data.mycommons.org/explorer. The data exploration tool has a certain set of metadata properties that can be used as filters for selecting subsets of study subjects and data files. NOTE: The properties used for filtering data are configurable and are chosen in collaboration with data commons sponsors, contributors and analysts. Contact the data commons support team with suggestions for a new property to be added as a filter. A spreadsheet containing available clinical, demographic, or experimental metadata can be downloaded by clicking on the corresponding button once a cohort or group of files has been selected. 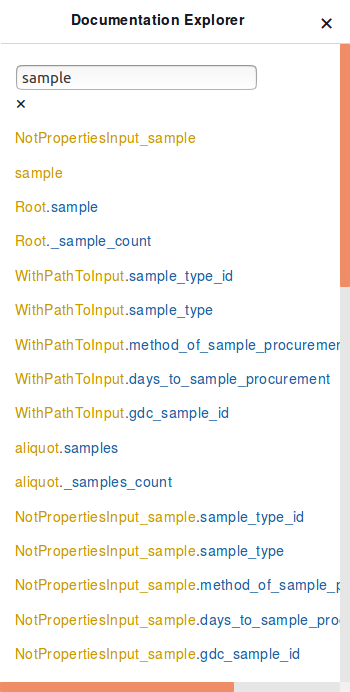 The metadata in a Gen3 commons can also be queried via the graphQL query language using the graphiQL interface, which can be accessed by clicking “Query” in the top navigation bar or by navigating to the url: https://data.mycommons.org/query. 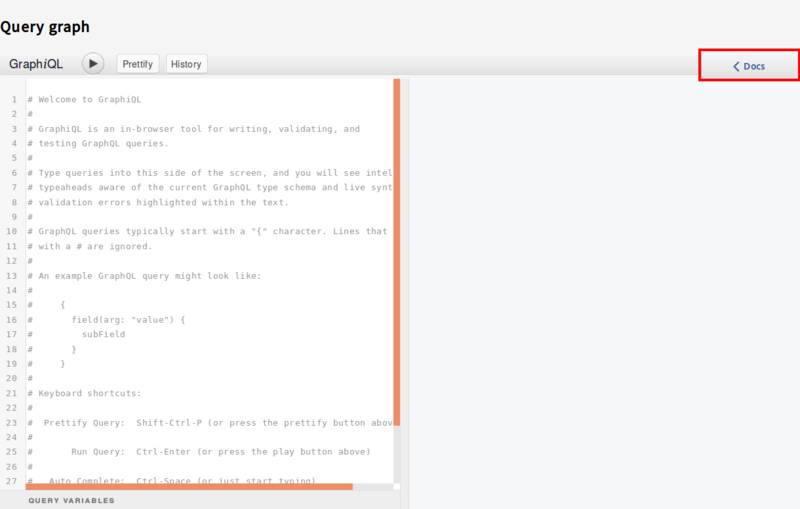 The “Docs” button can be pressed to see documentation of the queryable nodes and properties. For example, typing the name of a node, “sample”, into the “Search Schema” search-box, and clicking the “root.sample” option will display all the properties that can be queried for that node. 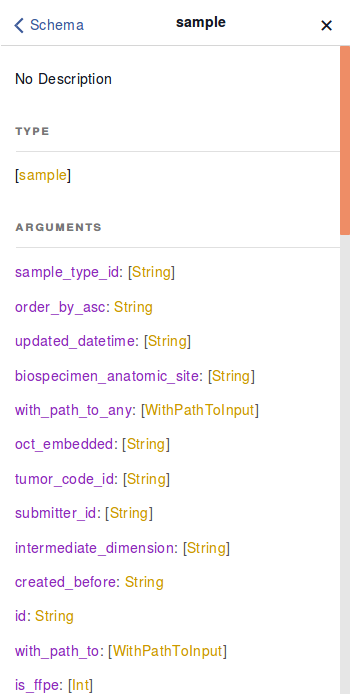 Queries can also be sent to the API programmatically using, for example, the python ‘requests’ package. Further details on how to send queries to the API are documented here. The sponsor of a Gen3 data commons typically decides how users will access data files in object storage. In some cases, approved users may be allowed to download files directly to their local computer from within an internet browser using the Gen3 data commons Exploration tool or with the gen3-client, which is a command-line tool. When more security is required, users may be required to download and analyze data files in a protected environment. Such environments include virtual machines (VM) in a virtual private cloud (VPC) or in the Gen3 Workspace, which is accessed by clicking on “Workspace” in the top navigation bar of the data commons website. For more information, see the documentation on how to access and use the Gen3 Workspace. 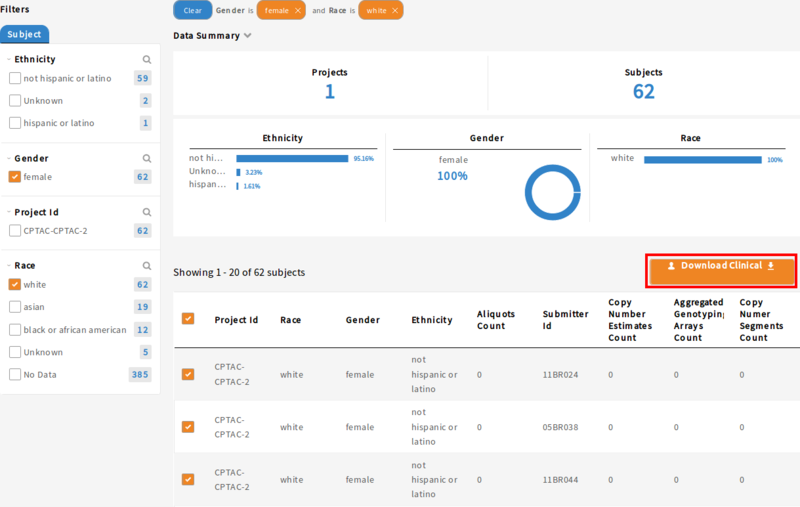 Files can be browsed using the data exploration tool in a Gen3 data commons. Individual files can be downloaded by simply clicking on the filename and then clicking the download button. Note: If a commons restricts data download access to within a virtual private cloud (VPC), then an “Access Denied” error will be displayed by the website. From within the Exploration tool, after applying the chosen filters to the list of study subjects or data files, they can be selected by checking the checkbox next to each case or file. Then, when the “Manifest” button is clicked, a file will be downloaded that contains all the GUIDs associated with the chosen cases or files. This manifest can then be used to download the files using the gen3-client.